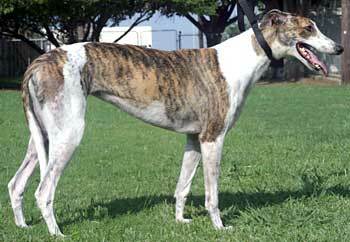 Taffy, aka Hilltex Honeybun, is a beautiful almost 2½-year-old white and brindle female born May 9, 2005. Her sire is the late Gable Dodge and her dam is Fuzzy's Bomber. She is sister to Holly, and both of them, along with Sissy, were the last three greyhounds in the inventory of A Place For Us Greyhound Adoption* in Albuquerque, New Mexico, which is closing down. There are no races to Taffy's credit on Greyhound-data.com. 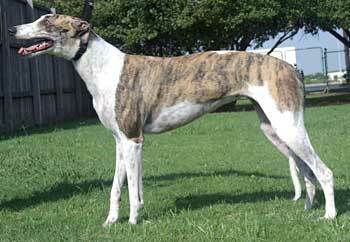 Taffy is outgoing and very sweet and gets along well with other greyhounds. Taffy is not cat tolerant but has not been tested with small dogs. *GALT sincerely thanks A Place For Us Greyhound Adoption for their 12 years of dedicated service to further greyhound adoption. 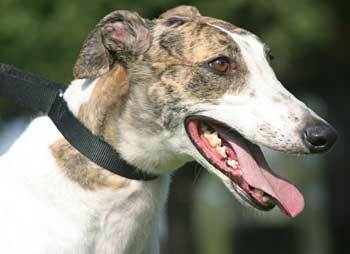 Laurel Drew and Elaine Summerhill, along with their volunteers, will be missed in the greyhound adoption arena. See the Fall 2007 issue of Celebrating Greyhounds "Saying Goodbye: The Closing of an Adoption Group" by Laurel Drew – closing down is indeed not easy. I think Taffy is perfect! I have seen no behaviors that need correcting. In fact, she is a joy. After we left Pet Stay and Play on Sunday, we went to a friend's to meet GALT's new Fort Worth stray boy, Carter. Taffy, Marty, and Darcy shared the back of the SUV without problems, they all played together in her back yard, and then Taffy took a nap on a dog bed. There was a small puppy there that was way too interested in Taffy, but Taffy just ignored her. After that visit, we all went to another friend's house to clip nails. Taffy avoided the pool nicely, ran around with the other dogs, and let me clip her nails. She seemed very relaxed and happy. Then we all drove home. All hounds slept all the way home. Taffy stretced out in the back and took up as much of the back of the SUV as possible, but didn't mind when Marty and Darcy cuddled up to her. Once home, she went straight out the doggie door, peed and pooped, and came back inside to eat dinner in the crate. She needed no help with the dog door at all! She settled in nicely, didn't mind Annie growling at her, and didn't care about the whippet sniffing her. She slept thru the night! The next day she really had fun...she found the full-length mirror in the guest bedroom, and spent some time admiring her reflection. She also discovered the toy box and the rawhides. I had a friend over installing new flooring, and when he was touching up the baseboards Taffy stayed with him, resting her head on his shoulder as he worked his way around the room. He was so infatuated with her, and I think she loved him! She is very sweet, loves to kiss and cuddle, and has a very happy tail. She'll wag her tail when I look at her, and really gets it going when I talk to her. Taffy likes to follow me around, play with stuffies, and eat. She has no issues with other dogs and has done absolutely nothing to cause me not to trust her fully. It's like she has already been in a home, or she's very bright because nothing is a problem for her: noises, ceiling fans all get taken in stride. She has no desire to get on furniture, loves to meet anyone who comes by, and is having a blast with the other dogs. This is an excellent little girl...anyone would be thrilled with her and, she feels so good!! She has the most beautiful coat.